William Anastasi (WA): How was the length of time of your immersion determined? Was it predetermined or was it determined by what went on while you were immersed? Monika Weiss (MW): The time of my immersion in water was determined before I did the project. I decided it was going to be six hours, but I wasn't sure how I would feel. In my studio, before the project at Diapason, I immersed myself for several hours. After six hours I wasn't really able to go far beyond. I would get very cold and then very sleepy. The day after I wanted to go back to the vessel. It felt as if someone took something important away from me. WA: While traveling through Europe with artists Marina Abramovic and Uly, one of the things that I had remarked was that I have difficulty with art that is damaging. It's one of my difficulties with ballet also, because it's very hard on the body. It sounds as if you tried to extend Ennoia as far as possible, short of some serious physical negative reaction. MW: I wasn't concerned about the level of comfort. I got cold. It was difficult, but it wasn't my goal to destroy anything in me. It's tricky. In my recent project Elytron I was immersed in paint for many hours. It took me a while to find a kind of paint that would not damage my body. You know, they told me it's ninety-five percent safe. So there was still this five percent. WA: I remember there was a live video projection in your project. But it wasn't totally live. Was it an earlier recording? MW: I was interested in that tension, the suspension of disbelief. I am very interested in this way of translation; the way technology complicates presence. A camera suspended from the ceiling and positioned centrally above the vessel recorded the projected image. So what you saw on the large screen was a view from "above." But to further complicate the situation the image was recorded at an earlier time; it was an almost identical view of an earlier immersion. 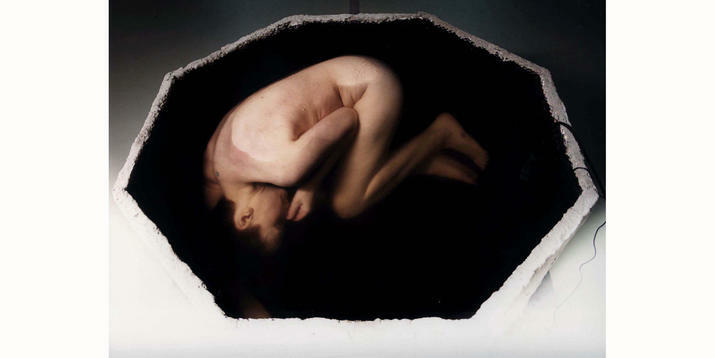 That aerial view of a curled-up body in an embryo-like position has become crucial in most of my recent projects. In the recording techniques like film- and microphone-based technologies, it's important to me that there is this availability in terms of preservation and manipulation of the moment. A bird's eye view (the suspended camera) records and mediates my actions, translating them into flat, disembodied, painterly images that constitute a map of the ground. I like to expose the camera's surveying, cold, motionless eye that scrutinizes a very intimate, private, quiet, and solitary ritual of immersion. Even with a hundred people in the room, the water provides a sense of veiling. It becomes a blanket, and a protection at the same time as it is a mirror. So what you saw was a projected image of a view from above, but also a view from before, while I remained physically inside and underneath. WA: I like the idea of reality mixed with something very close to it, which is virtual. I've done a video piece, Free Will, which has the virtual picture of the corner and the actual corner. Your work - this particular piece - seems connected with the idea of a video version of an earlier reality. It's a video memory of a performance while you are doing a very similar performance. MW: It's also the same object, so you think it's the same time, but it's a lie. WA: All art is a lie. In German, art also means "fake." Like [Nam June] Paik's fish in a fishbowl. He took the inside of a monitor - beyond the screen is an actual fish do you remember that piece? I feel like you were informed by the piece on some subconscious level. MW: I was primarily interested in the act of immersion in the baptismal font and states of endurance, duration, and continuity. I think repetition, like my circular movements inside the vessel, creates a rhythm that has the ability to redefine the reality. Reality accumulates (Eva Hesse used the word "accumulation" in that sense); it becomes its "beyond." These are small acts that happen under constrained circumstances. By "small" I want to say "insignificant," the way Agnes Martin once wrote about trying to be smaller, being like a grain of sand. WA: So you immerse yourself for long stretches of time. Why? MW: I like to remove the beginning and the end from the experience, both from others' and mine, leaving just the space. That's why I want to come back for many hours, for days, creating a site of eternal return, a kind of a loop in time, a situ-ation, nevertheless permeated by gradual, almost invisible change. To create a place where people come and go, encounter something that happens almost the same, and almost all the time. Just like life itself. Like a grid in time and in space. Hours, days, the change of light. There is this gradual change, like getting tired, like the way we disappear. I have not used my own body until the last several years, when I began to feel a tremendous need for presence of body. I was obsessively drawing a silhouette curled-up inside a chalice, viewed from above, the octagonal black hole with just a contour of body, contained, along the edges of the opening. The tension between my presence and the presence of an object, and the presence of others, are related through the idea of containing and being contained, the way my body is both a container and an object contained, the way buildings are vessels, prone to overflow. Water, video, and sound are sites of mirroring; they are reflective, they multiply and alter. What happens between the body and its trace creates a new quality. WA: Were you brought up Catholic? Did you ever become skeptical? And if so when did you become skeptical? MW: I think I gradually became skeptical until I reached a point of rupture. As a child I was quite skeptical because of the form. The way things were explained or not explained, the way that Church and Communist ideologies erased each other. I took religion classes to be prepared for first communion. That's something people do in Poland. WA: In south Philadelphia also. MW: Before the rupture I had my own vision of religion. I went often to the cemeteries. I liked the smell of freshly harvested earth. The way it probably smelled when Ana Mendieta pressed her naked flesh against the dirt somewhere in a deserted landscape of Iowa. WA: Baptism is a thing to erase the original sin. You are born with original sin and only this wonderful organization called the Roman Catholic Church can eradicate it. The same Church, which threatened to burn Galileo when he said that the earth moved around the sun. I was brought up in that tradition. I wouldn't be surprised if my wife's family secretly baptized my three children. James Joyce's two children were secretly baptized. MW: For me baptism is a metaphor, a state of passage. I am interested in the physicality of it. The feeling you get when you go underwater, how it shifts your view of the outside. Drinking, in-taking, overflowing, immersing, are all about the same ontological dis-rupture. WA: There is the return to the pre-natal state, since we are in water for the first nine months of our existence. WA: ... and for the first million years or so our predecessors were in water. In "civilized society" we are constantly told to be cleansed. Urine is dirty. But this is only particular to a certain level of what we call civilization. It's part of our problem that we accept that essential and natural functions are shameful. MW: That's why I don't see that much of a difference between water and other fluids, like oil; and I work with other fluids, also. But I am probably the most attached to water because of the mirror nature of it and because you can see through its transparency. WA: No oil or any liquid is possible without water. We are mostly water. So there is this circular thing that Ennoia is doing. MW: Carolee Schneemann once said that the most important split in our culture is between body and mind. That's where the visual tension comes from for me as well. When we connect body and mind (and they connect rarely, in a mutual sensation), it creates a crack in space. I think sometimes that I can do it through silence. I am interested in silence. Speaking is an expression of mind, and so much so, that I think speech is a way of erasing the body. Silence is not about absence of sound, but rather about quietness; the hush of early dawn, at the boundary of the world. There is muteness in the sounds of machines, for example, and similarly in the sounds of the operations within our bodies; an inability to articulate, a certain void. WA: You were silent, but I did enjoy the kind of sound that was in there. Even just the sound of what you were doing - the moving of your body in water. And it was interesting to be in that level of light and hear what people were saying. Of course I have a different approach towards mind. The human mind is the most complicated thing we know of. What is body for you? MW: I grew up thinking that my body was only some kind of shameful tool or a case to carry the things we have inside, which we really are. My body is an immediate sculptural material. It's inescapable. I view it from its inside as opposed to the scientific external gaze. But all materials that I work with are equal, for example water, paper, cement, liquid make-up, motor oil, resin, human flesh, video projection, sound technology, other people, time, text, light. Body is an overflowing chalice and this motif reappears in my work. Baptism and fluidity are about overcoming the ontology of the self and the other. I somehow want to disturb the space of the body. During repetitive actions or video sequences, I introduce subtle changes that suggest states of being outside time, where there is no beginning, middle, or end, in an ongoing state of initiation, covering, anointing the body with water, which baptism is. WA: It's an interesting area to work in. Baptism is either a barbaric tradition carried over from pre-modern times, which millions of people believe is the only possible way of salvation, the very first thing that must be done. Or it is a cleansing, a symbolic cleansing for people who don't subscribe to that horrendous idea that hell, or at least limbo, is waiting for them. The reason why baptism interests me so much is that it was the thing I couldn't accept. I was told by the nuns that anyone who is not baptized of fire, water or desire - baptism of desire is if you lead a good life, according to the tenets of local morality, baptism of fire is when you undergo martyrdom, and baptism of water is the kind we all know- ...So I asked a question when I was twelve. What about the infants who die before they reach the age of reason? They are deprived of the sight of God. They go to limbo, the place where you are not unhappy, you are just... deprived. MW: Deprivation is about limits but also about liminal states - states of being on a threshold of something. Why are people of all ages and kinds suffering and dying? I asked, and the priest said we are not to understand him. And so I (she) left. I was twelve. I probably never reconciled that "melancholy moment," as Julia Kristeva would call it. What we are left with is only the ability to observe that silence, the muteness of images, representations, the memories of events. My childhood recollections of images are comprised of faceless bodies, crucified or falling down, powerless, like in Pietˆ, transgressing toward the androgynous. I observed old women kneeling in the churches in front of naked figures engaged in an unclear act of suffering or pleasure, as if asleep, embodied, inside their bodies. WA: If the Church is correct that life is just a brief preparation for eternity, then that would be correct. You can't beat it, if you take their premise. I believed what they said when I was nine. I was extremely devout. I guess I've been devout in whatever. If I am a socialist, I am a devout socialist. MW: I am a heretical socialist. WA: Certainly you and I are heretics.